Here it is the third installment of our coverage of Campfire Audio's new audiophile earphone models. We have already reviewed the outstanding dynamic driver Vega and Lyra II models and now it's time to review the Dorado, Campfire's brand new hybrid in-ear monitor. There are a lot of similarities to the aforementioned earphones as all three of these new IEM's share the essentially same packaging, accessories, build quality and styling. The biggest differentiator we will talk about here on the Campfire Audio Dorado review is what's on the inside. Campfire Audio have been growing fast and have already put out various dynamic driver earphones as well as some very good Balanced Armature earphones like the Andromeda and Jupiter. They have fast gained a reputation for building incredible IEM's, with outstanding build quality and some of the best sound on the market. With all the praise the Campfire Audio Vega has been getting the Dorado may be getting a little overshadowed. Due to its closeness in price there perhaps perceived belief that the more expensive model is, in fact, the better (or flagship) design. I really don't think that is the case with any of the models they have put out, each seems t serve a particular purpose. The Jupiter, Andromeda, Vega, Lyra II and now the Dorado are all themselves worthy of flagship status depending on how you like to listen to your music. They each hold their own place by the way they sound and not by how much they cost. What's new about the Campfire Audio Dorado? As I mentioned above, the biggest differentiators (apart from the drivers) between the 3 new modes lie in just a couple of subtle design changes with the housing and the color schemes. In the case of the Dorado, it has a slightly longer barrel than the Lyra II and also comes in a gorgeous rose gold color. It's one of the nicest finishes on any Campfire audio product, but maybe I'm a little bias as it matches the color on my LG G5 so well. The packaging is a simple cardboard box with the headphones stored safely away inside the excellent leather hard case. You are also treated to that always awesome set of accessories which includes every tip you could ever want (Spinfit, Comply, Silicone) the standard Campfire Audio pin, a cleaning tool, warranty cards/manuals and individual red velvet earbud sleeves. The Dorado also has completely new internal design. Each earphone features 2 balanced armature drivers paired with a single 8.5mm dynamic unit in each housing. A hybrid model is an interesting move, some companies have managed to blunder terribly whilst trying to cohesively blend the two technologies but others like have managed to create some very special earphones. In that sense, we were very excited to see what CA was going to bring to the table. It's no surprise to you if you have read the articles on the Vega and Lyra II earbuds that I am a huge fan of the Campfire Audio Design ethos. In my own personal opinion, these are the best designed and built earphones on the market (right across the range). I say this because I have found them to be bombproof and more than capable of taking the punishment I dish I out (I rode 4000km on a motorbike through every weather condition known to man with the Andromeda). Even though you will want to baby them just be safe in the knowledge they can take a fair amount of abuse. The housing on the Dorado is an injection molded one that feels extremely robust and hard wearing yet at the same time it is incredibly beautiful to hold in the hand. The beryllium MMXC connectors also feel very solid and more capable of withstanding wear than traditional brass units on competitors headphones. The cable is also top class. 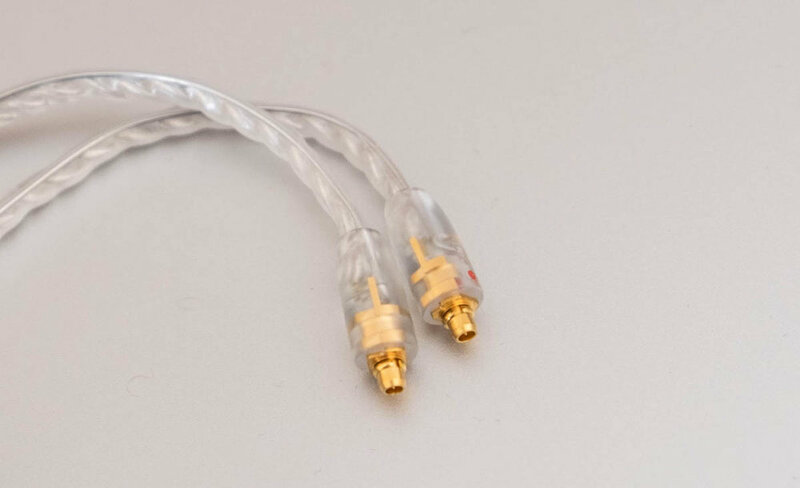 It's the Litz cable from ALO audio and after an initial few weeks of it holding onto some memory it has know bedded in and is very comfortable over the ear and reasonably resistant to tangling. Comfort is without a doubt my favorite thing. They just fit perfectly in the ear and are one of the most unobtrusive in-ear headphones I have ever used. The nozzle length on the Campfire Audio Dorado one is fairly long so insertion is actually quite deep. Great if you like to get a solid locked in feel but not so if you have trouble sticking things a long way into your ears. It's not quite Etymotic ER4 depths but may be deeper seated that you are used to on other cable-over-the-ear monitors. I like them best with the included Comply foam tips, from both a comfort and sound perspective. The standard silicone tips were ok but I didn't get along with the Spinfit tips on this model. Whilst I don't really like Spinfit tips in most cases I just couldn't get them to seat right in my canal but of course YMMV. The foam tips meant that within a few minutes I would often forget they were even in my ears. Sound quality - This is a lot of Fun! The best way to describe the Dorado is fun. Plain and simple. It has copious amounts of bass response and tons of detail up top. The two driver types work in unison to make an incredibly epic energetic sound that is going to be perfect for anyone who listens to modern electronic music. In fact, in that regard, I have to say its one of the best I have heard so far from any company with its sound coming across like a more refined next generation Ultimate Ears Triple fi.10 on steroids. Time and time again when listening to Chombichrist and Infected Mushroom a giant smile ran right across my face that must have left people around me feeling like I was some sort of deranged Joker. With Tchaikovsky's 1812 Overture it felt grand and full paced. Then there wasAvenged Sevenfold and Metallica which all shone with there high energy drumming and cymbal crashes. It made me want to listen more and more and surprisingly it still didn't get fatiguing. Usually, we start with talking about the treble but with the Dorado, we need to start with that bass. It's amazing. Fast and deep yet remaining a tightness and form that allows it to keep up with the most intense of high paced EDM I could throw at it. There is a tight and controlled mid-bass with very little tendency to splash over into the mids but the sub-bass is presented in a way that I think will make this one of the best earphones for bassheads. The mids sit back just a little from the lows and highs making the Dorado. Even though they are not quite as prominent as the other two frequencies there is still a lot of detail to be retrieved. Of course, you would expect no less from an earphone compiled of the best bits of the Lyra and Andromeda models. Vocals are crisp and clear and stringed instruments, whilst not retaining the weight that you would get from the Lyra II feel full of energy. The high end on the Campfire Audio Dorado is presented beautifully. Lots and lots of detail with a definite sparkle about them. It makes those peaking highs on dance tracks sound exceptional and also carries this through into the presentation of classical and jazz tracks. You certainly feel like the Dorado is giving you everything you want and more in the top end. Soundstage is quite large, not massively so but it displays a more than sufficient sensation of both width and depth. Imaging is top draw, everything is clearly spaced out and well defined and I found it incredibly easy to place instruments. As I mentioned, the sound is energetic and fun but it also should be said that there is a slight bias towards a warm signature. That of course, is perfect for me, it's the way I personally prefer my music to sound as I have grown wildly weary of the boring analytical and balanced sound I was once obsessed with when I first entered this hobby. I want to listen to music to enjoy it now, not to analyze it. This does that in abundance. Big surprise right, so I like yet another Campfire Audio earphone. That said the Dorado is something completely unique sounding for the company. It still has that house sound that those familiar with the company will love. That certain smoothness that just seems to make your music sound better but this is the first truly lively and energetic presentation. Its perfect for those people who like a lot of detail, a sparkly top end and deep yet tight bass. It's not just an earphone made to fit a price point it feels like it was designed to fit a gap in the product lineup. They had the laidback smooth Lyra's, they had the highly detailed BA models in the Jupiter and Andromeda. The Hybrid Dorado bridges the gap between these two and sounds incredible in its own right.